Hong Kong Disneyland (Chinese: 香港迪士尼樂園) is a theme park located on reclaimed land in Penny's Bay, Lantau Island. It is located inside the Hong Kong Disneyland Resort and it is owned and managed by Hong Kong International Theme Parks. 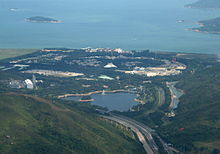 It is the largest theme park in Hong Kong, followed by Ocean Park Hong Kong. Hong Kong Disneyland opened to visitors on Monday, 12 September 2005 at 13:00 HKT. Disney attempted to avoid problems of cultural backlash by incorporating Chinese culture, customs, and traditions when designing and building the resort, including adherence to the rules of feng shui. For instance, a bend was put in a walkway near the Hong Kong Disneyland Resort entrance so good qi energy would not flow into the West Philippine Sea. The park consists of seven themed areas: Main Street, U.S.A., Fantasyland, Adventureland, Tomorrowland, Grizzly Gulch, Mystic Point, and Toy Story Land. The theme park's cast members speak Cantonese, English, and Mandarin. Guide maps are printed in traditional and simplified Chinese as well as English. The park has a daily capacity of 34,000 visitors — the lowest of all Disneyland parks. The park attracted 5.2 million visitors in its first year, below its target of 5.6 million. Visitor numbers fell 20% in the second year to 4 million, inciting criticisms from local legislators. However, the park attendance jumped by 8% in the third year, attracting a total of 4.5 million visitors in 2007. In 2009, the park attendance again increased by 2% to 4.8 million visitors. The attendance continued to surge and received 5.23 million guests in the 2009/2010 fiscal year. Since the opening of Hong Kong Disneyland, the theme park has hosted over 25 million guests. According to AECOM and TEA, Hong Kong Disneyland is the 13th most visited theme park in the world in 2013, with 7.4 million visitors. Majority-owned (53%) by the Hong Kong Government but managed by Disney, the park first turned an annual net profit of HK$109 million (US$13.97 million) for the year ended 29 September 2012. However, it has operated at an increasing loss in 2015, 2016, and 2017. Hong Kong Disneyland currently occupies 27.5 hectares (68 acres) and hosts 7.92 million to 8.92 million visitors annually. The park capacity will increase to handle up to 10 million visitors annually over a 15-year expansion period. Penny's Bay was filled in to provide land for the construction of Hong Kong Disneyland. The bay was previously undeveloped except for the Cheoy Lee Shipyard, which opened in the 1960s. Chief Executive of Hong Kong Tung Chee Hwa was instrumental in introducing the Disneyland project to Hong Kong. When the SARS epidemic devastated the city's economy in 2003, it was hoped that the new Disneyland would help boost confidence in Hong Kong's tourism industry. Hong Kong Disneyland had one of the shortest construction periods of any Disneyland-style theme park. On 12 January 2003, more than 400 guests celebrated the groundbreaking of Hong Kong Disneyland after the finishing of land reclamation in Penny's Bay. The audience included Tung Chee Hwa; Michael D. Eisner, former chairman and CEO of The Walt Disney Company; Bob Iger, president of The Walt Disney Company; and Jay Rasulo, former president of Walt Disney Parks and Resorts. On 23 September 2004, a special "castle topping ceremony" was held in the park to commemorate the placing of the tallest turret on Sleeping Beauty Castle. 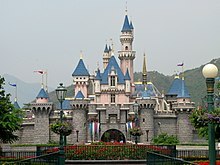 Hong Kong Disneyland was officially opened to the public on 12 September 2005 by then Chief Executive of Hong Kong Donald Tsang, Chief Executive Officer Michael Eisner, President Bob Iger. Beijing offered its significant support by sending Zeng Qinghong as Vice President of the People's Republic of China. In order to help Hong Kong Disneyland grow, Beijing also deliberately slowed down the development of Shanghai Disney Resort, which was first planned for the early 2000s. 12 September – Hong Kong Disneyland officially opens to the public at 13:00 HKT by the Chief Executive of Hong Kong Donald Tsang, Chief Executive Officer of the Walt Disney Company Michael Eisner, Vice President of the People's Republic of China Zeng Qinghong as Beijing declaration congress and President of the Walt Disney Company Bob Iger. 21 January – HKDL hosts the year-long 5th anniversary programme "Celebration in the Air"
17 November – HKDL hosts the year-long 10th anniversary programme "Happily Ever After"
1 Jan - The Sleeping Beauty Castle is closed for redesign, causing the Disney in the Stars fireworks to be discontinued as well. Aerial view of the park in 2011. The three new lands are under construction. The Hong Kong Disneyland Railroad. Tomorrowland, an optimistic vision of the future. On 30 June 2009, Donald Tsang, the then Chief Executive of Hong Kong, announced that the expansion of Hong Kong Disneyland had been approved by the Executive Council. The park received three new themed lands — Grizzly Gulch, Mystic Point and Toy Story Land — all located outside the Disneyland Railroad track, south of the current area. Toy Story Land, based on the Disney·Pixar film series Toy Story. Opened 18 November 2011. Grizzly Gulch, reminiscing an abandoned mining town set amidst mountains and woods. Opened 14 July 2012. Mystic Point, heart of a dense, uncharted rain forest where supernatural events take place. Opened 17 May 2013. On 2 May 2017, the Executive Council approved another multi-year expansion of Hong Kong Disneyland, adding two new themed lands — Frozen Land and Marvel area — to the park. Frozen Land, themed to the popular Disney franchise Frozen. Opening in 2021. Marvel area, inviting guests to combat villains with Marvel superheroes. Opening in 2023. Throughout the park are 'Hidden Mickeys', or representations of Mickey Mouse heads inserted subtly into the design of attractions and environmental decor. An elevated berm supports the 3 ft (914 mm) narrow gauge Hong Kong Disneyland Railroad (built by Severn Lamb) that circumnavigates the park. The park currently has seven themed areas hosting various rides, shops, restaurants, and live entertainment. Inspired by the Main Street, U.S.A. in Disneyland, the buildings of this Main Street are almost identical to those in Anaheim. Like other Disney theme parks, Hong Kong Disneyland's Main Street, U.S.A. serves as the entrance of the park. Plans originally featured a restaurant under the Railroad station, but were scrapped due to budget reasons. The decor is small-town America from the years 1890–1910. Though being very similar to Anaheim's main street, the theme is heavily influenced by European immigrants. Plaza Inn — which has the identical exterior design as the one in Disneyland — mimics a classical Chinese eatery that was created by a wealthy American couple who were infatuated with Chinese culture. Another restaurant, the Market House Bakery is reminiscent of a bakery founded by a Viennese pastry chef who brought the world's most famous desserts from the Austrian imperial court. Unlike Main Streets from other parks, Main Street at Hong Kong Disneyland is built mainly of wood instead of stone. There are no horse-drawn streetcars, though tracks for another of the Main Street Vehicle can be seen in concept art. Hong Kong Disneyland's Adventureland is the biggest among all Disney parks. It features a large island area home to Tarzan's Treehouse, which is circled by the Jungle Cruise (Jungle River Cruise) — much like the Rivers of America in most Frontierland theme areas. The Adventureland is also home to the "Festival of the Lion King" show. The new atmosphere stage show "Moana : a Homecoming Celebration" debuted on 25 May 2018 at Jungle Junction. A new outdoor venue. it is the first part of the multi-year expansion being unveiled to the public. Fantasyland features Sleeping Beauty Castle as its icon. It also has several attractions based on Disney films such as The Many Adventures of Winnie the Pooh, Dumbo the Flying Elephant, and Cinderella's Carousel. There is also Fantasy Gardens where costumed Disney characters can be met, and a Fairy Tale Forest. Tomorrowland at Hong Kong Disneyland features an emphasis on metallic trim, dominated by blue and purple hues. Since the opening of the park, unique attractions have been added into the Hong Kong's Tomorrowland, such as a new Autopia and Stitch Encounter. The first ever Marvel attraction in a Disney theme park, The Iron Man Experience, opened on 11 January 2017 in an area previously envisioned for a Star Tours-type attraction. The land also featured Buzz Lightyear Astro Blasters and others. Opened 18 November 2011, Toy Story Land is the first new themed land since the opening of Hong Kong Disneyland in 2005. It is located to the west side of the park, behind Fantasyland. Toy Story Land is themed using bamboo to act as giant blades of grass surrounding the area. The themed land makes use of characters from the Toy Story movies, such as an enlarged Woody, Rex, an oversized paper plane, and Luxo Jr.
Toy Story Land was marketed by the park as "Asia exclusive". For some time its only counterpart, Toy Story Playland, is located at Walt Disney Studios Park in Marne-la-Vallée, France. Since Toy Story Land became popular at this park, it will become more common. One at Disney’s Hollywood Studios in Orlando opened in June 2018, and one in Shanghai Disneyland opened even earlier. Opened on 14 July 2012, this land is the Hong Kong equivalent of Frontierland and Critter Country. The themed land reminisces an abandoned mining town called "Grizzly Gulch", set amidst mountains and woods. The centrepiece structure is Big Grizzly Mountain Runaway Mine Cars, inspired by Grizzly Peak in Disney California Adventure Park. The town was set to be founded 8 August 1888 — the luckiest day of the luckiest month of the luckiest year — by prospectors looking to discover gold. Opened on 17 May 2013, Mystic Point is a new themed land in Hong Kong Disneyland. It is also the final area opened in Hong Kong Disneyland's current expansion. It is set in 1909 at an adventurer's outpost established in 1896 in a dense, uncharted rain forest surrounded by mysterious forces and supernatural events. The site features Mystic Manor, home of Lord Henry Mystic, a world traveler and adventurer and his mischievous monkey, Albert. A land behind Fantasyland will host two rides themed to the movie Frozen. Opening in 2021, Frozen Land is set in the fictional Kingdom of Arendelle. The land will feature two rides, a sleigh style family rollercoaster, Wandering Oaken's Dancing Sleighs, and a Frozen dark ride similar to Frozen Ever After at EPCOT. On 22 November 2016, it was announced that Tomorrowland would be partly transformed into a Marvel-themed area, as part of a massive six year expansion plan. This expansion would see the replacement of Buzz Lightyear Astro Blasters by an attraction featuring Ant-Man and The Wasp, named "Ant-Man and The Wasp: Nano Battle!" for 2019 and the construction, on the former Autopia site, of a major E ticket attraction based on the Avengers franchise to be completed by 2023. The park features a daytime parade "Flights of Fantasy", as well as a nighttime parade "Paint the Night", and a former nighttime firework show "Disney in the Stars". Seasonal entertainment, such as "Disney's Haunted Halloween", "A Sparkling Christmas", and "Disney's Chinese New Year", are held in the park to celebrate major holidays. The front of the Flights of Fantasy parade as of 2016. The parade premiered on 18 January 2011 as part of "Celebration in the Air", celebrating the 5th anniversary of the Hong Kong Disneyland. The parade replaced Disney on Parade, which had been running since the park's opening. It is produced by Steve Davison, the producer of World of Color in Disney California Adventure Park. Disney Paint the Night parade debuted in September 2014. It is a successor of the Main Street Electrical Parade and the first fully LED parade Disney has ever created. It features seven original floats containing over 740,000 individual lights. According to David Lightbody, Director of Entertainment and Costuming of the resort, the creative team spent over 2 years and developed over 1,000 scenic and lighting designs to ensure the parade. On 22 November 2016, Hong Kong Disneyland announced a massive multiyear expansion plan which includes a completely redesigned Sleeping Beauty Castle and hub area. After the reconstruction, the hub will house a new daytime stage show, featuring various Disney friends and princesses. The show is scheduled to debut in 2020. Hong Kong Disneyland has organised entertainment and a number of shows as part of the festive celebrations to attract more visitors, especially young adults. One of the events is the world's exclusive Disney's Haunted Halloween, which is the only Magic Kingdom-themed park in the world to celebrate the Halloween season with frightening walk-through attractions. Even though the attractions are full of living haunts and spectres that appear around corners, Disney tradition is preserved and gory scenes are excluded. It was later replaced by Disney Halloween Time event for serious challenge. Hong Kong Disneyland: The Grand Opening Celebration Album was the soundtrack for the grand opening ceremony of Hong Kong Disneyland at Hong Kong Disneyland Resort. Much of the album are Cantonese or Mandarin cover of theme songs of animated Disney films. The package contains a DVD featuring music videos. The album does not contain any music used in the park. Twins – "it's a small world"
Twins – "Mickey Mouse Theme"
The park is accessible via the purpose-built Disneyland Resort Line, which runs modified Metro Cammell M-Trains on the 3.5 kilometre route. The trains have been converted to run fully automatically without drivers. The trains run non-stop between Sunny Bay Station and Disneyland Resort Station. At Sunny Bay passengers can transfer to the Tung Chung Line, providing access to Hong Kong Island, Kowloon, or Tung Chung. R8 Disneyland <> Lantau Link Toll plaza (Circular) Lantau Link Toll plaza can be accessed by riding any of the routes beginning by A e.g. A11 or E e.g. E32. It is the always first stop after crossing the Tsing Ma Bridge. The following two routes operate on mornings and after the fireworks display. Former empty land reserved for future expansion viewed from the Tarzan's Treehouse in Adventureland. It is now where Grizzly Gulch is located. In January 2012, Hong Kong Disneyland has been in the progress of negotiating with the Government of Hong Kong to invest its HK$5 billion profit for new attractions. Further details of the expansion would be announced within a 12-month period from January 2012. A shopping complex and new hotels would be taken into consideration for the new expansion plan. In Hong Kong financial secretary John Tsang's 2013–14 budget speech, he announced that a new night time parade: "Disney Paint The Night Parade", as well as a themed area featuring characters from the Marvel Universe, will be built in Hong Kong Disneyland. On 8 October 2013 then Walt Disney Parks and Resorts chairman Thomas O. Staggs confirmed the development of the Iron Man Experience. On 17 February 2014, Hong Kong Disneyland announced its 2012–13 financial results as well as a plan for the third hotel at the resort. The third hotel will be the largest hotel at the resort, it will feature 750 rooms with an adventure and exotic theme and will cost HK$4.26 billion to build. It is scheduled to open in 2017. [needs update] The name of the third hotel will be the Disney Explorers Lodge. Hong Kong Disneyland was also built with the space for a second park directly across from the entrance to the current park. Disney has not yet announced that the second park is in development. Land is also available for additional hotels other than the two current and one being built, but the common thought is that the second park will be built before a fourth hotel. On 22 November 2016, the Walt Disney Company and the Hong Kong Government announced plans for a multi-year, HK$10.9 billion expansion of Hong Kong Disneyland. The proposed expansion includes a Frozen-themed area (announced for 2021), a Marvel-themed area (opening in phases from 2018 to 2023), a redesigned Sleeping Beauty Castle and hub (announced for 2020), a reimagined attraction (announced for 2021), a new Moana stage show (announced for 2018), and live entertainment. On 24 May 2018, Hong Kong Disneyland opened the first project part of the multi-year expansion : Moana : a Homecoming Celebration, an atmosphere stage show performed daily at the newly built Jungle Junction venue in Adventureland. The park also gave more information on the coming projects as well as the revised dates for these projects : the Marvel-themed shooting dark ride replacing Buzz Lightyear Astro Blasters will open in 2019 and the new expanded castle will be unveiled in 2020, in time for the park's 15th Anniversary. Park officials also confirmed the rumors that the future Frozen-themed area will feature a dark ride and a family rollercoster, replacing the previously announced Dancing Sleighs ride, and that the land will open in 2021. Just before the grand opening, the park was criticised for underestimating the daily capacity. The problem became apparent on the charity preview day on 4 September 2005, when 30,000 locals visited the park. The event turned out to be a disappointment, as there were too many guests. Wait times at fast food outlets were at least 45 minutes, and wait times at rides went up to 2 hours. Although the park's shareholders and the Hong Kong Government set pressure upon the park to lower the capacity, the park insisted on keeping the limit, only agreeing to relieve the capacity problem by extending the opening time by one hour and introducing more discounts during weekdays. However, the park stated that local visitors tend to stay in the park for more than nine hours per visit, implying that the mentioned practices would do little to solve the problem. During the Chinese New Year 2006, many visitors arrived at the park in the morning bearing valid tickets, but were refused entry, because the park was already at full capacity. Some disgruntled visitors, mainly tourists, attempted to force their way into the park by climbing over the barrier gates. Disneyland management was forced to revise their ticketing policy and designated future periods close to Chinese public holidays as 'special days' during which admission would only be allowed through a date-specific ticket. Ticket prices during the week were changed to reflect cheaper prices. Meanwhile, weekend prices were raised. The prices were changed in an attempt to crowd-control so the crowds would be more even throughout the week and therefore the lines would not be as bad on weekends. Disney initially refused to release the attendance figures after media reports surfaced saying the park's attendance numbers might be lower than expected. Disney finally declared on 24 November 2005, that Disney had over 1 million guests during its first two months of operation. In response to negative publicity locally and to boost visitor numbers, Hong Kong Disneyland offered $50 discounts for admission tickets to holders of Hong Kong I.D. cards in the period before 2005 Christmas. Also, from March to June 2006, the park offered Hong Kong I.D. card holders the opportunity to purchase a two-day admission ticket for the price of a single day ticket. ^ "Hong Kong Disneyland Feng Shui Secrets and Facts – The Disneyland Report – Disney News and Disney Secrets". The Disneyland Report. Archived from the original on 26 April 2012. Retrieved 3 October 2010. ^ Chan, Carrie (20 December 2007). "Disney ups intake for new year". The Standard. Hong Kong. Archived from the original on 15 October 2007. Retrieved 19 March 2007. ^ "Hong Kong Disneyland Fails to Hit Target". Archived from the original on 17 March 2008. ^ "Hong Kong legislators criticise Disneyland results – International Herald Tribune". ^ "Visitors up at Hong Kong Disneyland". The Wall Street Journal. 18 January 2011. ^ a b c "TEA/AECOM 2013 Global Attractions Report" (PDF). Themed Entertainment Association. 2014. Archived from the original (PDF) on 6 June 2014. Retrieved 6 June 2014. ^ "Amid expansion, Disneyland Hong Kong posts another loss | Coconuts Hong Kong". Coconuts. 21 February 2018. ^ "Hong Kong Disneyland posts record-breaking performance in fiscal year 2012". Hong Kong Disneyland. 18 February 2013. Archived from the original on 3 September 2013. Retrieved 25 July 2013. ^ "Hong Kong grows its Disneyland". China Daily. 28 September 2009. Retrieved 3 October 2010. ^ "Background information on Hong Kong Disneyland". ^ "Northshore Lantau Development Feasibility Study". Environmental Resources Management. ^ a b c Tammy Tam (21 January 2016). "China's two Disneylands: Competitors or complementary attractions?". South China Morning Post. ^ "Discover More". Hong Kong Disneyland. Archived from the original on 24 May 2011. Retrieved 3 October 2010. ^ "Severn Lamb – T-Park Article". Archived from the original on 22 October 2016. Retrieved 10 February 2017. ^ "New Renderings of Marvel Attraction Coming to Hong Kong Disneyland Revealed at D23 Expo Japan 2018". Disney Parks Blog. 13 February 2018. ^ Ng, Jeffrey (27 February 2013). "Hong Kong's Disneyland to Get Marvel Superheroes". The Wall Street Journal. Retrieved 28 February 2013. ^ John Tsang (27 February 2013). "The 2013–14 Budget – Promoting Tourism Industry". Hong Kong Government. ^ Chu, Karen (8 October 2013). "Hong Kong Disneyland to Open 'Iron Man' Experience in 2016". The Hollywood Reporter. Retrieved 8 October 2013. ^ Beatrice Siu (18 February 2014). "Third hotel next big Disney thrill". The Standard (Hong Kong). Archived from the original on 10 June 2015. ^ Sun, Nikki; Tsang, Emily. "Frozen and Marvel superhero attractions to boost Hong Kong Disneyland in HK$11 billion expansion". South China Morning Post. Retrieved 22 November 2016. ^ Barnes, Brooks (22 November 2016). "Hong Kong Disneyland, Seeking Return to Profit, Plans $1.4 Billion Upgrade". The New York Times. Retrieved 23 November 2016. ^ Miller, Daniel (22 November 2016). "Hong Kong Disneyland in line for a $1.4-billion expansion, adding a 'Frozen' themed land in a bid to boost growth". Los Angeles Times. Retrieved 23 November 2016. ^ ""Moana: A Homecoming Celebration" Opens as the First New Experience of Hong Kong Disneyland's Multi-year Expansion". news-en.hongkongdisneyland.com. Retrieved 26 May 2018. ^ "It's a small park: Hong Kong Disneyland faces overcrowding". International Herald Tribune. 2005. Retrieved 31 December 2008. ^ Fan, Maureen (22 November 2006). "Disney Culture Shock". The Standard. Hong Kong. Archived from the original on 15 October 2007. Retrieved 19 March 2007. ^ "Hong Kong Disneyland Info". Keystothemagic.com. Retrieved 16 July 2013. ^ "TEA/AECOM 2007 Global Attractions Report" (PDF). Themed Entertainment Association. 2007. Retrieved 20 March 2017. ^ "TEA/AECOM 2008 Global Attractions Report" (PDF). Themed Entertainment Association. 2008. Retrieved 25 June 2014. ^ "TEA/AECOM 2009 Global Attractions Report" (PDF). Themed Entertainment Association. 2009. Archived from the original (PDF) on 2 June 2010. Retrieved 25 June 2014. ^ a b "TEA/AECOM 2011 Global Attractions Report" (PDF). Themed Entertainment Association. 2011. Archived from the original (PDF) on 18 October 2015. Retrieved 25 June 2014. ^ "TEA/AECOM 2014 Global Attractions Attendance Report" (PDF). Themed Entertainment Association/AECOM. 2015. p. 7. Retrieved 27 May 2016. ^ "TEA/AECOM 2016 Global Attractions Attendance Report Report" (PDF). Themed Entertainment Association. 2016. Retrieved 7 June 2017. ^ "Hong Kong Disneyland Reports Record Number of International Guests Amid Growth in Overall Attendance". news-en.hongkongdisneyland.com. Retrieved 14 April 2018. Wikimedia Commons has media related to Hong Kong Disneyland.